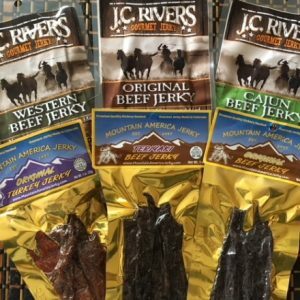 Dahlonega Jerky Co. 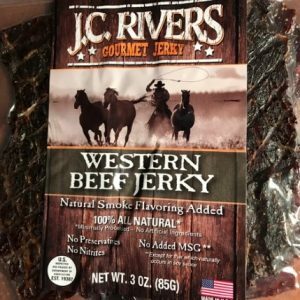 Taste Local – Moonshine Pork jerky is handmade from slices of Pork Tenderloin marinated in a sweet and smoky blend of seasonings and real white lightening. 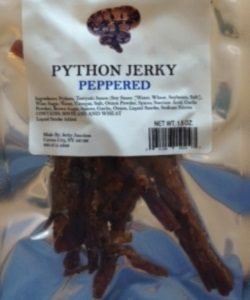 No added preservatives, No MSG or nitrites; USDA/FDA approved. Ingredients: Pork, brown sugar, teriyaki sauce, Dawsonville Distillery White Lightening, wine, vinegar, salt, spices, onion powder, garlic powder, honey, maple syrup, pineapple juice, cinnamon, liquid smoke, black pepper, ginger, ground cloves.